Perfect for when you're working up a sweat, the Active Quarter Crew Sock is made with a soft cotton blend to offer you all the comfort you need. Featuring a soft rib welt and leg, as well as a smooth toe seam for no rub, you'll be able to keep moving comfortably all day long. Comes in a 5-pack and is colour coded for easy pairing. The softest socks I have ever worn. 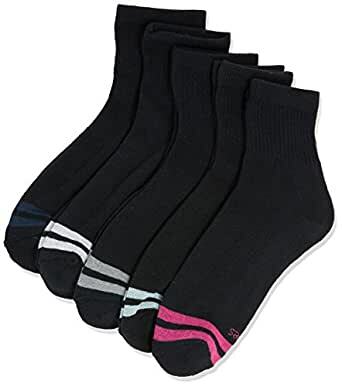 Washes very well and I love the thick cushioned soles whereas the rest of the sock isn't bulky, just where it counts.I am a size 9 so I got 8+ ones. I will definitely buy again ! .